Cross the leg that is towards the wall, behind your other leg. Lean your hip toward the wall, and feel a stretch at the outside of your hip. Hold the stretch for 30 seconds. Repeat with the other leg, then repeat the entire sequence 4 times. Slowly twist toward your bent leg, supporting with your hand behind you. Place your other arm on the side of your bent thigh and support it to twist further. Look over your shoulder and hold the stretch for 30 seconds. Come back to the center. Lie on your stomach on the floor with a pillow under your hips. Bend one knee at 90°. 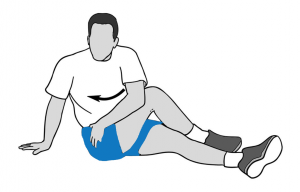 Gradually lower your leg down to the floor, counting 1 to 5. Lie on your side on a table with a pillow under your head and between your thighs. Bring your top leg forward and lower your foot so that it is below the tabletop. ( refer – “start” position). Your bottom leg can be slightly bent for balance. 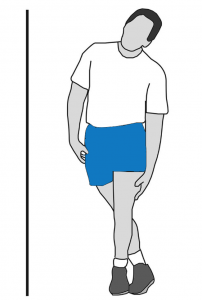 Rotate your hip and lift your foot as high as possible (refer- “finish” position). Gradually lower your leg back to the “start” position, counting to 1 to 5. Lie on your side on a table with a pillow under your head for comfort. Place your lower arm in front of your body. Bring your bottom leg forward and lower your foot so that it is below the tabletop (refer “start” position). Your top leg must be straight to help you balance. 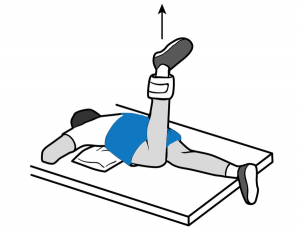 Rotate your hip and lift your foot as high as possible (refer “finish” position). 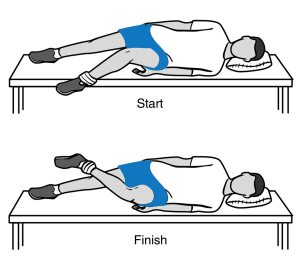 Slowly lower your leg back to the “start” position, counting 1 to 5.